Some people may experience occasional discolored, painless spots in their mouth. Most are harmless and will disappear or remain unchanged. However, some sores or spots can be serious and need the attention of your dentist or physician. For example, oral cancer may not be painful at first, but it can be deadly. That’s why regular dental checkups are important. Have your dentist examine any mouth sore or spot that fails to heal within two weeks. Cold sores – caused by herpes virus Type 1 or Type 2 – are contagious. The initial infection (primary herpes), which often occurs before adulthood, may be confused with a cold or the flu. 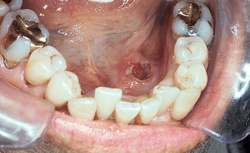 The infection can cause painful lesions to erupt throughout the mouth, and some patients can be quite ill for a week. Most people who get infected with herpes do not get sick, however. Once a person is infected with herpes, the virus stays in the body, where it may remain inactive. Unfortunately, in some people, the virus becomes activated periodically, causing the cold sore to appear on the lips or other sites. A variety of irritants (wind, sun, fever, stress) can cause a flare. Lichen planus (li-ken PLAY-nus) is a disorder that involves a chronic, itchy, inflammatory rash or lesion on the skin or in the mouth. The lesions may consist of white spots or “lacelike” white changes. Lesions on the sides of the tongue, insides of the cheek and on the gums, may be tender or painful. Its cause is genetic and related to a chronic immune system reaction.